In late September, Hurricane Maria hammered Puerto Rico at nearly Category 5 strength. With maximum sustained winds of 155 mph, it was the most powerful storm to strike the island since 1932. For more than 30 hours, the gales lashed the island—snapping trees, toppling buildings and destroying already battered and delicate infrastructure. It plowed ashore near the southeastern town of Yabucoa and traversed to the northwest, sparing nothing in its path. In the face of such large-scale destruction, traditional logistics—interior roadways, the island’s two international airports and communication channels in general—were in chaos. Miguel Estremera ’98, a native of Puerto Rico with many family members on the island, learned from Jeff Ciarcia ’11 that air traffic controllers in San Juan, among them former classmate Tony Baez, were living at the ATC facility because their homes were destroyed. Their generator had exploded, crippling an already precarious operation to safely navigate relief efforts into the area. And food and water were dwindling. 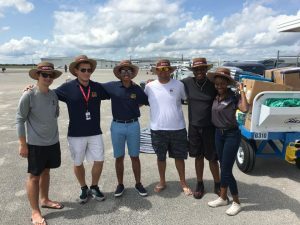 Determined to help bridge the gap and get resources and medical supplies to those in need, Estremera, a Boston-based United Airlines pilot, sparked a humanitarian effort that inspired not just the Florida Tech community but the larger Melbourne area as a whole. The effort began by mobilizing his College of Aeronautics (COA) family. One of Estremera’s first calls was to friend and fellow alumna Jo Damato ’97, who put him in touch with the PALS Sky Hope Disaster Relief Program. Damato was a founding member of Sky Hope, which formed in 2010 to help connect business aviation with humanitarian relief efforts. The organization had recently merged with PALS, or Patient AirLift Services, to form a more comprehensive network dedicated to providing support during emergencies and urgent situations. Through her position with the National Business Aviation Association, Damato has many contacts in the industry. With a Citation jet and pilot secured, through the partnership of PALS Sky Hope, Estremera got on the phone with more COA friends. Mike Antalffy ’01, who lives in Houston, agreed to donate $30,000 toward the purchase of generators and supplies for the mission, but the team needed ground support. Enter Fin Bonset ’96, ’99 M.S.A., College of Aeronautics Alumni Association (COAAA) president. At daybreak on Sept. 27, while at the beach for an early morning surf, Bonset answered the call. So Bonset alerted the COAAA network, through a combination of social media and a good old-fashioned phone tree, who responded in force. The excitement was tangible; the benevolence contagious. Staff at Walmart donated a gift card toward the purchases, while other shoppers spontaneously pitched in too. After a second stop at Causeway Mowers for more generators, the caravan arrived at Orlando Melbourne International Airport (MLB) with nearly 4,000 pounds of supplies. Loaded down and fueled up—with jet fuel donated by the Florida Tech College of Aeronautics—Estremera and pilot/aircraft owner Paul Weissman set course for San Juan. With additional COAAA support—thanks to connections made by Milton Alvira ’16 and Michael Santana ’16, ’17 M.S.A.—they received the necessary ground clearance, a challenge for a civil flight in a disaster area, and arrived in San Juan by 3:30 p.m. The support could not have come a moment too soon. Estremera was shocked at the situation he encountered when he arrived. 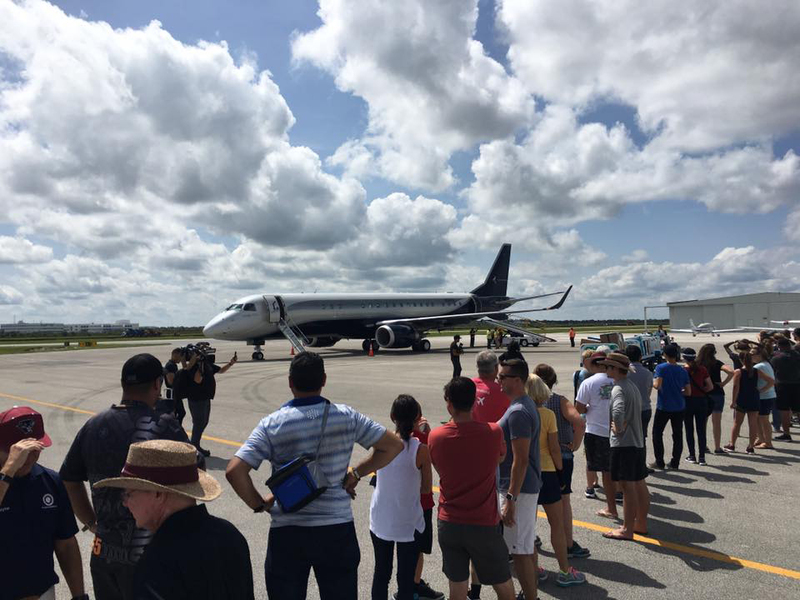 Volunteers line up to load supplies aboard the private jet of actor/comedian Tyler Perry, who donated his aircraft to help during the second mission. As word spread about the success of the first mission out of Melbourne, Estremera received a call a few days later from representatives for actor/comedian Tyler Perry, who wanted to donate his private jet toward the cause. In the meantime, Carlos Cerezo ’96, a JetBlue pilot who had weathered the storm at his home in Aguadilla in western Puerto Rico, had safety evacuated to Palm Bay the following week and had donated generously to the first mission, was eager to funnel additional relief to Aguadilla. A friend, the president of the hospital’s board of directors, was able to put Cerezo in touch with the facility’s medical director who provided a list of needs. The effort required a lot of phone calls and a little luck. With his local connections, Cerezo assumed the role of Aguadilla ground coordinator, while Estremera managed the flight logistics and Bonset arranged another supply run in Melbourne. Tyler Perry’s jet, an Embraer 190, 90-passenger converted private jet—a much larger aircraft than the Citation used on the first mission—was scheduled to arrive at MLB on Sept. 29. Bonset alerted Greg Donovan ’91, MLB executive director, who pledged the full support of his staff and facilities. By that afternoon, nearly 100 volunteers were stationed at the Atlantic Jet Center—including president T. Dwayne McCay, COA student groups, faculty, staff and alumni—to help load nearly 7,000 pounds of relief supplies bound for Aguadilla and San Juan. 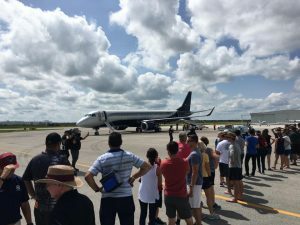 The flight also transported a team of doctors to the area, while helping other ill and elderly Puerto Ricans return to the continental United States for medical care. Overall, Bonset explained, it was a collection of great people who came together to make a real difference. Something Dean Korhan Oyman says is unique to the College of Aeronautics. And participate they do. Each member of the mission agrees. The outcome has been as heartwarming for the volunteers as it was for the beneficiaries. “I’m very proud to be a part of the alumni association, and I’m very thankful for these relief flights that helped my island,” says Cerezo, who returned to his home in Aguadilla two months after evacuating. He says things are getting better, slowly but surely. At the time of this writing, the local hospital was still operating at half-capacity due to the extensive storm damage, and Cerezo’s home was still without power. Since these initial missions, Estremera has coordinated several others, primarily out of West Palm Beach or the New England area. He has volunteered as PALS Sky Hope’s mission coordinator on a total of seven flights to aid Puerto Rico. As the pace of recovery has improved, ongoing missions have focused primarily on medical evacuation for critically ill Puerto Ricans. While Estremera has no longer needed direct involvement from his COA family, he knows they are just a phone call away.